BANGKOK, Thailand (February 29, 2016) - CEO of Absolute Hotel Services Group Jonathan Wigley is delighted to announce the second Eastin Grand Hotel in Bangkok and third in company's portfolio. 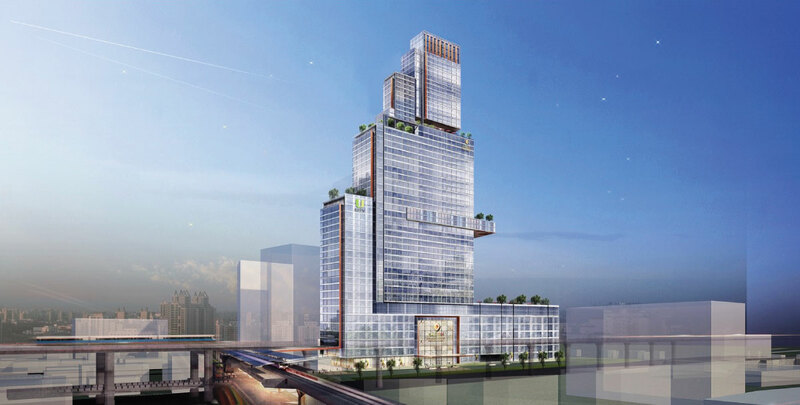 Eastin Grand Hotel Phayathai Bangkok will be a mixed use complex with hotel element and office space with some retail. The hotel's targeted date of opening will be in second quarter of 2019. Eastin Grand Hotel Phayathai Bangkok has a great location with direct access to Phayathai BTS skytrain station and will consist of 394 rooms and suites, ranging from 34 sqm - 154 sqm, including superior rooms, deluxe rooms, suites and a honeymoon suite. Plus 175 serviced apartments consisted of one and two bedrooms. Other facilities will include a 1,200 sqm all day dining market style restaurant, a wine bar, a specialty restaurant, seafood market by Chef Man' Chinese restaurant, Starbucks, outdoor large swimming pool with pool bar, gym and executive lounge. Functions and event spaces of a total of 4,285 sqm will be one of a kind in Bangkok with modern high technology to serve all sorts of functions and special events. The hotel will also have a 285 sqm wedding studio to cater full services for any couples. "We are very excited about this project as it will have everything for all purposes and to be expanding Eastin Grand brand portfolio in Thailand, offering our guests the very best service and facilities coupled with our brand promise of value for all occasions." said Mr. Wigley.